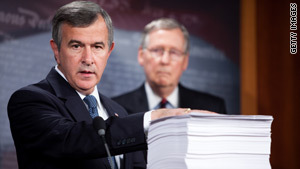 Sen. Mike Johanns, R-Nebraska, (pictured last month) moved to send the bill back to committee. Washington (CNN) -- Senate Republicans failed Saturday to eliminate $42.1 billion in cuts to Medicare home health care service in the health care bill. The 53-41 vote shot down a motion offered by Sen. Mike Johanns, R-Nebraska, that would have sent Majority Leader Harry Reid's sweeping $848 billion reform plan back to committee with instructions to remove all home health care cuts. Johanns objected to the cuts, saying that the services "help some of the most vulnerable Americans." Democrats say the bill instills needed reforms to ensure the long-term solvency of the government-run Medicare health program for senior citizens. In response, Sen. John Kerry, D-Massachusetts, offered Saturday an amendment to protect home health benefits. The Senate passed the amendment 96-0, on the sixth day of Senate debate on Reid's 2,074-page bill. But while the debate continued on the Senate floor, other work was going on behind closed doors, as a group of nearly a dozen liberal and moderate Democrats met to try to hash out a compromise on one of the most contentious issues in the bill -- the public option. Health and Human Services Secretary Kathleen Sebelius also participated in the talks this afternoon. "There are all kind of discussions on the table about public option and other things," Sen. Sherrod Brown, D-Ohio, told CNN. "It's pretty clear where the great majority of Congress is and where the great majority of the country is on this bill. And I just want to see the president speaking out and talking to those members that are a little less enthusiastic to support it," he said. "We're talking about different things. ... I don't even know if I would call it a compromise; I would call it a proposal that involves a lot of different moving parts," said Sen. Russ Feingold, D-Wisconsin. Two senators whose votes are key to passing a bill said they have yet to see a compromise they can support on the the public option. "There are a lot of discussions going on and I'm going to work hard to see if there isn't somewhere to be in terms of a compromise, but I haven't seen it yet," Sen. Blanche Lincoln, D-Arkansas, said Friday. Sen. Joe Lieberman, I-Connecticut, was less open to compromise on Friday, saying he won't be satisfied until the public option is stripped entirely from the health care bill. "I think the better political compromise is to get the public option out of there and do the rest that's good," said Lieberman. Like Lincoln, he supports much of the Democrats' enormous health care bill. Lincoln and Lieberman, along with Sen. Mary Landrieu, D-Louisiana, and Sen. Ben Nelson, D-Nebraska, oppose a public option, but they are four votes Democratic leaders are likely to need to get the 60 votes required to pass a health care bill. They could afford to lose one of those votes if they succeed in luring Republican Sen. Olympia Snowe of Maine, who also has been open to compromise. Landrieu said that she thought meetings such as Saturday's were "extremely helpful." "When you scale everything back, there is room for common ground here," she said. On Sunday, President Obama will go to Capitol Hill to meet with Senate Democrats as the health care debate rages, a White House official and a senior Democratic source told CNN. The meeting is set for 2 p.m. The House of Representatives narrowly passed a more than $1 trillion health care bill this month. If the Senate also manages to pass a bill, a congressional conference committee will then need to merge the House and Senate proposals into a consensus version requiring final approval from each chamber before moving to Obama's desk to be signed into law.